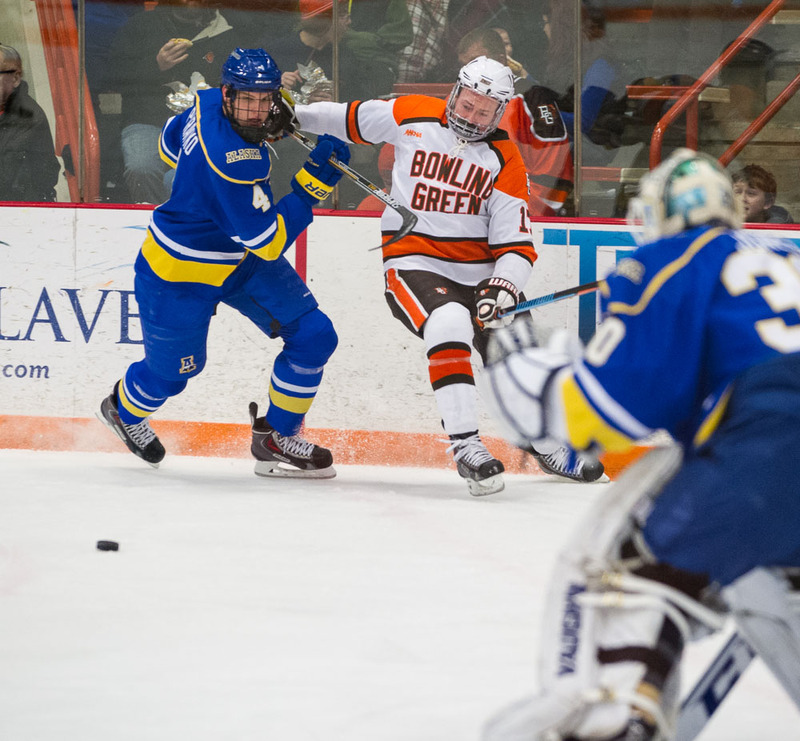 Bowling Green’s striving to shore up the defensive portion of its game. BG is fifth in the Western Collegiate Hockey Association in overall goals allowed at 2.18 goals per game and fourth in league games goals allowed (2.07 gpg). The Falcons, ranked sixth nationally, are coming off a split at No. 10 Tech. Tech rallied from a 2-0 deficit to post a 4-3 win in Game 1 before the Falcons rebounded. BG built a 3-0 lead in the second game and held off Tech the rest of the way for a 3-2 win. “When you look at the tape from both nights, there are situations we weren’t tight enough from a back-checking defensive standpoint and a defensive zone standpoint,” BG coach Chris Bergeron said of the Tech series. The Falcons are 14-4-4 overall and 10-2-2 in the WCHA, going into a home series this weekend against Lake Superior (6-19-1, 5-13). BG is still one point behind Tech for second place in the WCHA, but has two games in hand on the Huskies. “Our competition and intensity wasn’t good enough, enough of the time,” Bergeron said. “But, at times, it was pretty good. We want to play harder than we did last weekend. We want to execute at a higher level. We want to defend at a higher level. RECAP: The Falcons haven’t lost consecutive games games since Jan. 31-Feb. 1 last season when they lost twice at home to Northern Michigan. OFFENSE: The Falcons are second in the league and 12t nationally in scoring, averaging 3.27 goals per game. They’ve scored three or more goals in five straight games and 16 times this season. PK: The Falcon penalty-killing is still first nationally at 93.2 percent. BG was 9 of 10 at Tech, the last coming Saturday on a major penalty with just 3:15 remaining in regulation and the Falcons holding a 3-2 lead. RECORDS: BG’s .727 winning percentage is fourth-best in the nation. Minnesota State is first (.801, 18-4-1), followed by Harvard (.750, 11-3-2) and North Dakota (.739, 16-5-2). Tech is tied for 10th (.688, 16-7-1). PAIRWISE: The Falcons are third in the Pairwise Rankings, which mirror the criteria for the NCAA playoffs. The top four teams receive No. 1 seeds for the regional playoffs. The NCAA playoff field consists of six automatic bids and 10 at-large bids. The automatic bids go to the six league playoff champions. LIGHT MENU: The BG-Lake Superior series is one of just two league series this weekend. The other sends Alaska (Fairbanks) to Tech. HOME ICE: The Falcons are 5-2-2 at home this season, including a 4-1-1 record in league games. Lake Superior is 1-6-1 on the road, going 0-6 in the league. SERIES: BG is 78-70-10 all-time against Lake Superior, including a 44-25-4 record at home. Lake Superior won three of the four meetings last season, winning twice at home and splitting in the Ice Arena. This weekend’s series marks the only regular-season meetings between the teams.